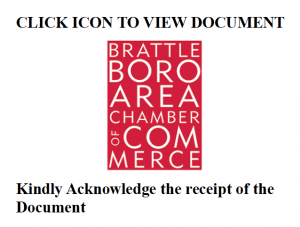 The message says “Please see attached for the new business License to carry out your daily business activities,failure to get new license will result in penalty on your business,thanks.” and is followed by “Susan Walker,” the Chamber’s mailing address, and the Brattleboro Area Chamber of Commerce logo. The email address it comes from is not the Chamber. The name of the sender is “NAVAJO NATION” and the email address is for a Pam Anderson charity, from what I can tell. To the best of my knowledge the employees at the Chamber are Greg and Kate. And this is a big giveaway, the Chamber doesn’t send out business license information. Business licenses come through the Assessors’ office. It is clever, though it is probably a coincidence, that the message is being sent out now, just a few months prior to actual business license fees being due. The email asks you to open up an attached PDF file, and that PDF file asks you to click on a link. Don’t do it. Send the whole message and attachment to your trash and ignore it. Clicking on the link will likely cause you trouble. I didn’t click it to find out which particular scam was being run – but it could install malware, steal information, and so on. FYI, confirmed by the Chamber that they didn’t send this out. They are warning members, too. Scams come in all disguises these days. It would be interesting to find out who’s inbox was impacted. This obviously went to people known to the Chamber, but not necessarily members of the Chamber. Somebody’s contact list was used, and that might mean there’s a virus or malware on that person’s machine.